Hosts Gena Rowlands and Martin Scorsese hosted the first screening of the newly restored A WOMAN UNDER THE INFLUENCE (1974, d. John Cassavetes) for invited guests at New York’s Museum of Modern Art on October 21st. Introduced by Ms. Rowlands, the screening was followed by a dinner that celebrated the film’s beautiful restoration by the UCLA Film & Television Archive. The film will have its public world premiere next spring at UCLA’s Festival of Preservation, and then its Northern California premiere at the San Francisco International Film Festival in April 2009. 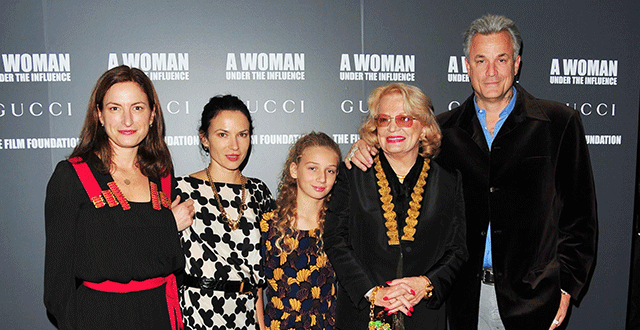 Gucci and The Film Foundation launched their partnership and the restoration of A WOMAN UNDER THE INFLUENCE at a special dinner in October 2006, attended by the film’s stars Gena Rowlands and Peter Falk, along with late TFF board member Sydney Pollack. Since then, Gucci and The Film Foundation have also funded the restoration of Michelangelo Antonioni’s LE AMICHE (1955), which premiered at the Bologna Film Festival in July 2008. The partnership will next fund the restoration of Barbara Loden’s WANDA (1970).